Though there has been much interest amongst importers, retailers and restaurateurs in New Zealand Sauvignon Blancs, we were surprised by the lack of interest in this tasting. Even a few tasters who paid for the tasting didn't show up! The wines were very nice, a refreshing change from all the oak and alcohol one typically encounters in a tasting of California wines. The 2001 harvest in New Zealand is said to be a small one, though increased plantings of Sauvignon Blanc, especially in the Marlborough region, accounted for an increase in production. Sadly, this bottle was severely "corked" and musty smelling. One taster described it as being "closed in and very light, with hints of pear, apple and some lemon-lime notes." Another taster felt it was "too tart," Someone else found it to show "alcohol and a bit of heat, while it's a bit heavy and yet simple." I detected a hint of peach and citrus, but found it lacking on the nose. On the palate, it's merely alcohol and acid with no real stuffing of flavor interest. Ho hum! "Grassy and intense, with even a hint of a Semillon note, this is a dry, bright, firm, crisp Sauvignon with good depth and intensity." said the first critic. Another taster pegged it as being "closed in and a bit dusty, with some Tutti-Frutti notes and an herbal, tart lemon finish." Someone else felt it was nearly "olive-like in that it had a salty quality to it." I found a lovely peach like fruit note with a hint of citrus. 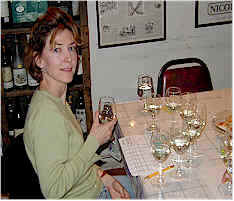 There's also plenty of "green," almost vegetal hints which are a strong feature of Sauvignon Blanc. It's mildly herbal on the palate, with nice citrusy qualities. One-and-a-half stars (3 stars is tops, 0 being standard or average). One taster felt this "didn't have much aroma." Another said it was "closed in." Someone else described it as "showing aromas of figs and limes, with ripe fruit...it's a little bitter." Another echoed the fig character, adding "it's grassy, warm and rich on the palate." My notes indicate citrusy, grapefruity notes with lemon peel to the sweet aromas. The same features shine on the palate, with good length and a zesty, zippy finish. One-and-a-half stars. "Peaches!" was the descriptor used by one taster for this wine, while another said it "reminds me the most of Sauvignon Blanc with a hint of grassiness, some weedy notes and apples." Another person found "crisp, melony, herbal, lemon-lime and guava notes." One fellow described it as "cat pee," while another person found it to be like some California wines in its "high alcohol, low acidity and overall empty character." I found the aromas to be very grapefruity and liked the wine as far as it goes...it simply didn't go far enough! I'll drink it, though. One star. One taster felt this had a lot of sulphur dioxide and found it objectionable when freshly poured. They added "it showed an herbal, grassy quality with nice flavors though after the wine aired. It was bitter on the finish, though." Another person agreed with finding this to be "bitter." Someone else said it "dropped off at the end and has a short finish." But another taster described it as having "good structure and balance...a complete wine that's well-stuffed." I found some minerally notes on top of a hint of citrus. The nose is a bit shallow. The flavors confirm the notes on the nose, although the wine has a spicy quality that reminded me of fresh, spicy ginger. One star. "Very pleasant, lighter citrusy aromas with a smooth and balanced feel on the palate." was how the first critic described this. Another person found "cat pee aromas, with melony flavors." Another said he was "impressed with the hint of oak and lactic notes...good structure, though a little bitter...complex, full and rich." I found peachy and citrusy notes with a spicy note on the nose. Citrus predominates on the palate with a faint hint of peach. We've had this in two blind-tastings and it's walked away a winner in both! "Really nice passion fruit and guava notes...might have a touch of sweetness with big, fat, pineapple and passion fruit flavors." said one critic. Another found "peaches." Someone else got "intense, grassy aromas, good depth and concentration." I found lots of sweet fruit and peach notes. There's a hint of honey to the nose and some floral quality, too. Tangy, fresh, zesty, pineapple flavors with a bit of grapefruit. Good length. Two stars.